A pretty interesting, witty, and clever drama about a mother and her two daughters who constantly move from place to place and find themselves in hot water. This is a powerful movie with quirky characters and lots of conflict. From the very beginning we learn of the problems of this small family unit composed of a mother (Cher) and her two daughters (Winona Ryder and Christina Ricci.) The mother is constantly having affairs with men and then moving her daughters to another state when the affairs go sour. The movie is about the three of them trying to start over in a new town and about both Mrs. Flax (Cher) and her daughter Charlotte (Ryder), meeting men and starting up relations with them. All of that might make the movie sound like a romance, but it’s not. This is comedic drama material with some deep ideas and creative characters. Bob Hoskins also appears on the scene as the new man in Mrs. Flax’s life, and he has some pretty heavy scenes in here, himself. It’s a smart and entertaining movie. Mermaids are a fun movie. 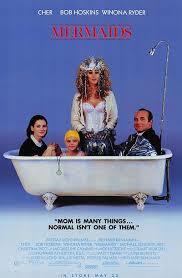 It’s a film about a teenager growing up as one of the daughters of a very strange mother. 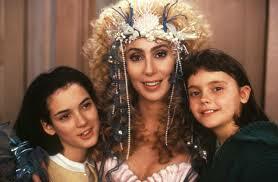 That mother is Mrs. Flax, played by Cher. She moves her kids around from state to state, constantly traveling around the country, looking for a place to call home. Mrs. Flax is the kind of woman who catches the attention of men, gets them to cheat on their wives, and then gets out of town before the neighbors learn of what she’s doing and turn on her. We see the movie through the eyes of her oldest daughter. Charlotte isn’t angry at her mother’s way of life, but she certainly doesn’t condone it either. Instead, charlotte has just kind of come to accept it. At the start of the film, we watch as Mrs. Flax has relations with a married man in his car and expects this man to take her away with him. When he doesn’t, Mrs. Flax returns home and starts packing. Charlotte knows all the signs by now, and knows exactly what is happening as she sits outside her mother’s room, listening through the door. The movie is told from Charlotte’s point of view, using voice-over to hear what she thinks about her situation. That’s a usual move for a film where the main character is pretty rational and levelheaded, and often the smartest person in the room. Only here, charlotte isn’t exactly those things. She thinks, for example, that a person can get pregnant just from sharing a kiss, and immediately after her first kiss with a boy, she runs off to the gynecologist to have her examined. Charlotte is very religious and constantly reads the bible. A joke about the whole thing, that we get early on, is that charlotte prays to Jesus and worships him as a major part of her life, and yet she is Jewish. Her infatuation with Jesus comes from something bigger than religion. It seems that she feels she is in debt to someone who sacrificed so much and went through such a hardship. Maybe she wishes her mother was a little more like that and sacrificed a little bit for charlotte and her sister, instead of constantly doing on what was best for her, often at the expense of her kids. The movie is a fish-out-of-water film taking place pretty much entirely in a new town that the mother and daughters arrive in. as they pull up to the driveway for the first time, they are greeted by a handsome young man who charlotte immediately gets a crush on. This is Joe, the local handyman who works at the Abby just up the hill. Everything about him, including where he works, seems perfect to charlotte. While charlotte meets Joe and starts hanging out with him, Mrs. Flax meets a nice man as well. She takes her girls to the shoe store one day and meets the owner, a man named Lou, (played by Bob Hoskins, in a really great performance.) Lou falls for Mrs. Flax pretty quickly, just like all men seem to do, only he’s not the kind of guy that will take any of her garbage or let her walk all over him. He watches her get ridiculous at times, like a moment when she starts to feel her daughters are starting to feel closer to him than they do to her. He watches and he calls her out on it and tells her how disgusted he is with the way she’s acting. I like the way this movie is basically about two different stories and two different relationships. We watch as charlotte pursues Joe and we watch as Mrs. Flax carries on with Lou. In the charlotte story, she carefully tries to ask him out in a way that seems as if it’s not really what she’s doing. He mentions that he’s going fishing over the weekend and she tells him that she loves fishing and asks to come along. The first half of the movie is really about forming these new relationships, and the second half is about different conflicts that unfold. One of these happens when charlotte runs away. She shows up at a family’s house telling of how her car broke down and is invited inside. That’s where she starts making up wild stories about her life, telling of the family she wishes she were a part of and pretending that it is really hers. I really like that it is Lou who goes to bring her home, and not Mrs. Flax. This movie is pretty deep and loaded up with conflict. Another one comes on the night when charlotte decides to actually go all the way with Joe, for real this time. Unfortunately she forgets some of her other responsibilities that night. Mermaids are a very good movie. It has unusual characters and lots of developing relationships that are put to the test. Christina Ricci plays the other daughter, who is much younger than Charlotte, and this character is really just used as a background plot device. That’s okay though, because we already have two stories going on in full force, and don’t really need anymore. I would have liked a scene where Charlotte and Mrs. Flax had it out about why the mother constantly starts up with married men and then moves the family from place to place, but even without it, this was a very enjoyable film.